For the Soviet rower, see Boris Fyodorov (rower). Boris Grigoryevich Fyodorov (Russian: Борис Григорьевич Фёдоров) (13 February 1958 in Moscow – 20 November 2008 in London) was a Russian economist, politician, and reformer. He was awarded a doctor of economics degree from the Moscow Finance Institute and authored over 200 publications. 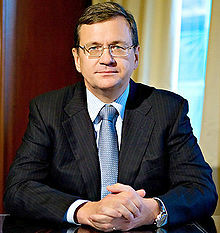 Fyodorov was Minister of Finance of the Russian SFSR (as a constituent of the USSR) in 1990. From 1991 to 1992 he worked for the European Bank for Reconstruction and Development in London. In 1992 he became director of the World Bank.He served as Finance Minister of Russia from 1993 until 1994, when he resigned. Fyodorov was a member of the State Duma between 1994 and 1998. In 1998 he became a tax minister and Deputy Prime Minister of Russia. In 1994, he and Charles Ryan,a United States banker and Libertarian, founded United Financial Group UFG, an investment bank with Charles Ryan as its chairman which was later, in 2005, sold to Deutsche Bank. Fyodorov was a member of various boards including Gazprom, Sberbank and Ingosstrakh. He was also a general partner of UFG Private Equity starting from 2006. Fyodorov died from a stroke on 20 November 2008 in London, England, at the age of 50. ^ Harding, Luke (21 December 2017). "Is Donald Trump's Dark Russian Secret Hiding in Deutsche Bank's Vaults?". Newsweek. Retrieved 17 October 2018. ^ Sampathkumar, Mythili (14 April 2017). "Former MI6 chief Richard Dearlove says Donald Trump borrowed money from Russia during 2008 financial crisis: Days before taking office, Mr Trump said Russia had never had any 'levarage' over him". The Independent. Retrieved 17 October 2018. This page was last edited on 20 December 2018, at 12:39 (UTC).